The goal of this chapter is to describe a process of touch screen technology development, beginning from basic cognitive research and resulting in an applied educational intervention for algebra. To that end, we introduce Graspable Mathematics (GM), a novel approach to algebra instruction that integrates strong theory and evidence from perceptual learning, cognitive science and mathematics education. We present a number of concrete examples of how this framework can be applied to technology-based interventions that aim to engage students in mathematics. This chapter will also describe many of the methodological, theoretical, and practical considerations that guided our iterative design and development, as well as address many of the challenges and lessons learned when implementing the intervention in classroom settings. This chapter begins with a literature review from cognitive science and mathematics education that explores the potential benefits of using perceptual training, guided discovery-learning, and learning technologies in algebra instruction. Building on this literature, we describe the theoretical framework of Graspable Mathematics, an approach that we have developed that applies touch screen interfaces to align the content of algebraic transformations with core cognitive and perceptual systems. 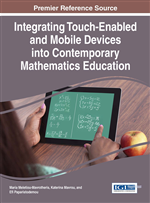 The second part of the chapter focuses on how touch-screen technologies that emphasize the Graspable Mathematics framework can successfully get students to engage with and explore algebraic concepts in novel ways. We describe a number of concrete examples of how this framework can be applied to technology-based interventions that aim to engage students in mathematics. We introduce From Here to There, a touch-screen application that embeds this approach and provides users with opportunities to explore algebraic concepts through discovery-based puzzles. The third part of this chapter describes many of the methodological, theoretical, and practical considerations that guided our iterative design and development, as well as address many of the challenges and lessons learned when implementing the intervention in classroom settings. We hope that the presentation of our process and asking questions will help lead to new advances in the development and use of research-tested technology in mathematics education. Future directions are discussed.